Born in Central New Jersey, Cody Josher works as a Supervising Mental Health Specialist with the Vets4Warrios program. He currently still serves in the United States Marine Corps Reserves, and is coming off orders from Iwakuni, Japan. Cody started working at Vets4Warriors in July 2016. His military career began when he enlisted in 2012 and would go on to be commissioned in 2015. As a Communications Officer, he has served as Platoon Commander for Wire, Technical Controller, and Cyber Network platoons. 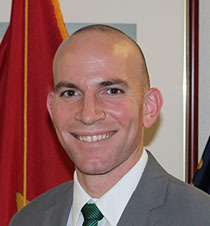 He has also served as an S-6 Operations Officer who oversaw the Communication architecture of Marine Corps Air Station Iwakuni as part of the Force Realignment in the Pacific. His formal education includes A.S. in Criminal Justice from Middlesex County College, and a B.S. in Sociology from Towson University. While at Towson University, he finished his degree overseas in Sydney, Australia with a study abroad program. When Cody is not working, or serving his drill period, he is an avid traveler. If he’s not planning his next trip, he is trying to check something off his bucket list, such as learning the piano, or becoming fluent in another language.